« Summer Fun in Cooking Classes! Anne Cori appeared on Fox 2 News this morning, roasting poblano and bell peppers as a perfect addition to any grilled meat. 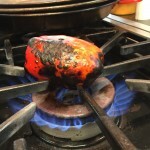 Roasting peppers can be done on a gas stovetop, under a broiler, or on the grill. Use a roasting rack for smaller peppers! Make sure that you have a good set of tongs for roasting the pepper, and a Swiss peeler for creating lovely parmesan shavings used in our recipe! Roast the red bell pepper until charred and blackened. Cover and let steam until cool. Peel off the skin, remove the ribs and seeds, and cut into thin strips. Whisk together shallot, vinegars, and drizzle in olive oil. Toss the lettuce with dressing and top each salad with red pepper. Garnish with parmesan shavings.